I have several interests, but one of them is traveling old trails. About twenty years ago my Dad and I talked about traveling the Oregon Trail. I even went as far as figuring out which paved roads came closest to it. I found out that the beginning of that trail had several jumping off points, so we picked Independence, Missouri as our point of beginning. But time and events both his, my Mom’s and mine got in the way; and we kept putting off the trip. Dad died in 2003, and we never got around to it. But several years later while Chuck was in Idaho on his annual fishing trip with his buddies, I flew to Independence and followed the Oregon Trail by car all the way to Boise, Idaho where Chuck joined me. We continued until Oregon City, Oregon at the trail’s end. Years later I spent some time again following the Lewis and Clark Trail, again while Chuck was fishing . I began in nearby St. Louis, Missouri and ended at Great Falls, Montana. I’ll do the rest of this trail later—in fact some of it later this year. This trail is a water trail mostly following the Missouri River and then other westerly rivers, but it is almost impossible to do it by boat because of all the dams. Chuck and I just did another one of the old trails and several old roads back in March. We were on our way back from staying at my sister’s bedside in Winston-Salem, NC. We thought she was doing better because she was progressing so rapidly, and Chuck needed to get some stitches out from an outpatient surgery that had been done a few days before Pam was placed in the hospital. So on our way back down to Florida, we picked up this migratory route in Lodge, SC and followed it all the way west and south to Millegeville, Ga. where our daylight ran out. This research was for my book “Palmetto Pioneers”. I was trying to determine how the Walker Family migrated from their home in South Carolina to their new land in Jefferson County, Florida. 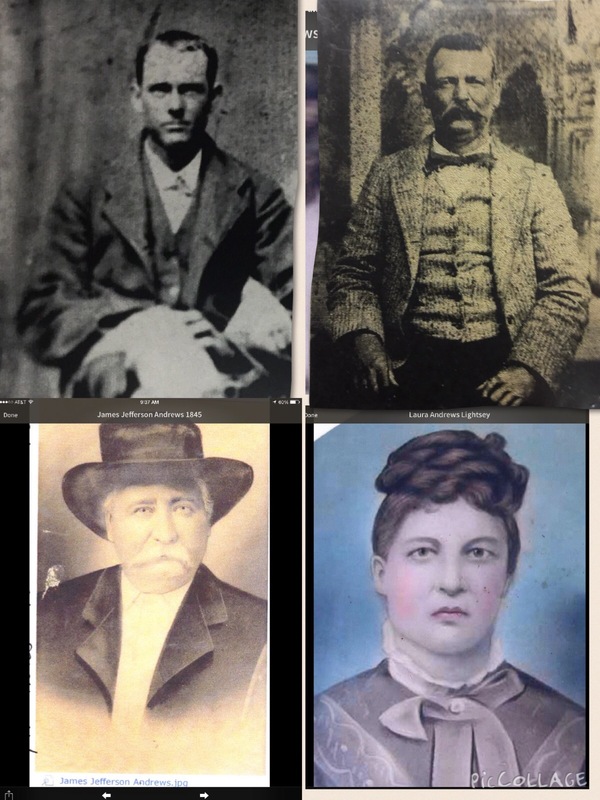 I know that my Walker family migrated to Florida around 1828 to 1829, and so I tried to figure out how they got here. I learned through research that the area west of Macon, Georgia, had just recently opened up due to a treaty between the Creek Nation and our government. I also learned that the only road into this part of Florida at that time was one of the old trails called the Hawthorne Trail. 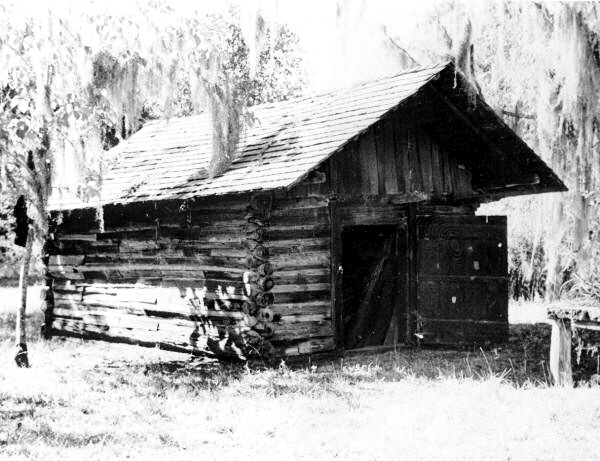 It started somewhere up on the Old Federal Road west of what is now Macon and passed down near Cairo, GA before ending near Concord, Florida north of Tallahassee near the Florida/Georgia state line. But how did they get from Lodge, SC all the way to the Macon area on the Old Federal Road? So starting in Macon, Georgia, I looked for roads that were here in 1827; and since there were few and many times only one road or trail, I worked back using these roads or trails to their home in SC. It is speculation or at best an educated guess. The Hawthorn Trail ran south from the Old Federal Road. For our purposes the Old Federal Road ran from near Macon to the west, all the way to Mobile. 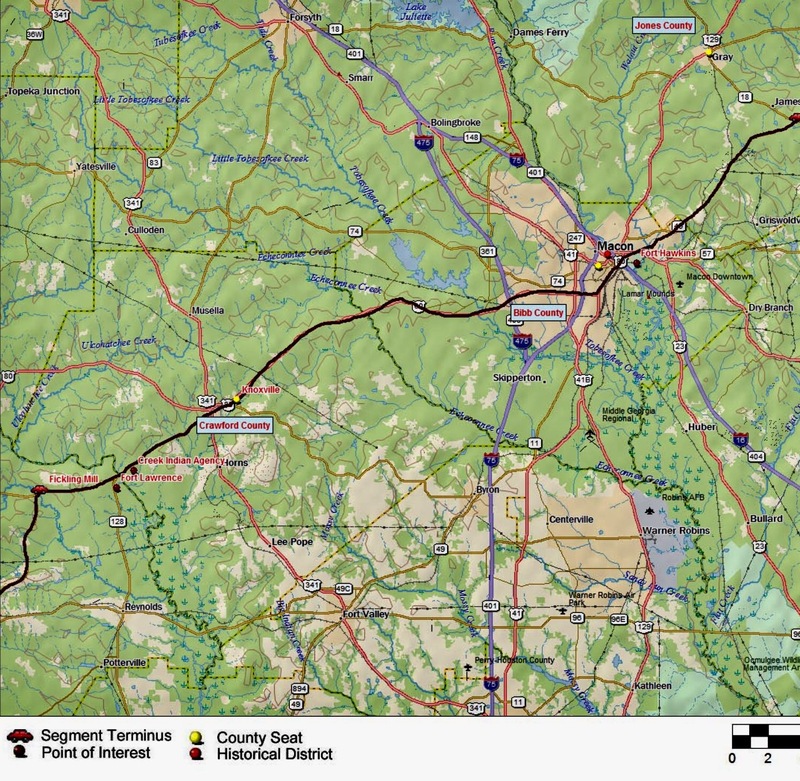 It connected with the Fall Line Road which ran through Milledgeville, GA, which was then the capitol of Georgia. The Fall Lind Road was one of the oldest roads in America, and it ran from Philadelphia all the way down well into Alabama. 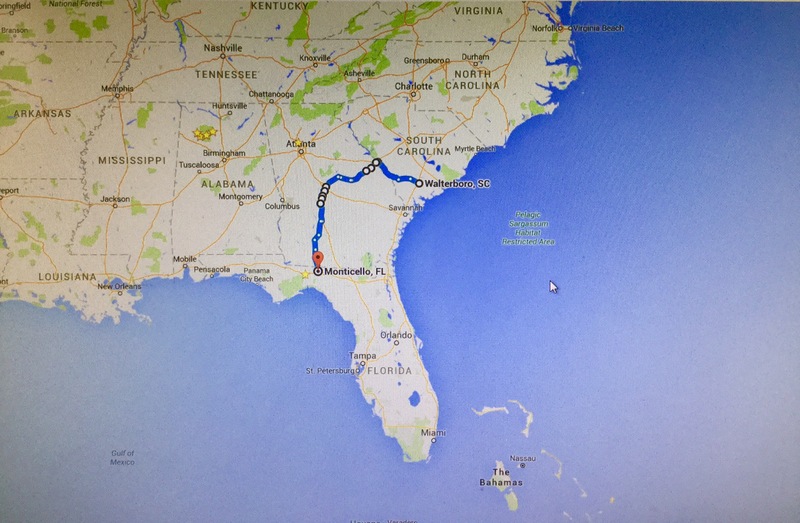 For our purposes, though, we are only interested in that portion which ran from Augusta, Ga., to Milledgeville. But again how did they get to Augusta from Lodge, SC which is located in the South Carolina low country southwest of Charleston? I found an earlier route or road between Charleston and Augusta. Actually it was called the Fort Moore-Charleston Road. Fort Moore was located across the river from Augusta in South Carolina. It was an earlier trading post, and Augusta grew up around this area. The commerce continued between the Indians and Europeans until eventually the fort closed and was abandoned, but this area across and up the river to just before the fall line is where the city of Augusta continued to grow. Once I discovered these early trails or roads, I looked for a current road or roads which followed it as closely as possible. It turned out to be US 78 which ran all the way from Charleston southwest to where Fort Moore used to be then from Augusta and down through Thomson, Georgia. I found it amazing that one major road today followed a good part of this early migratory route. So with my research fairly complete, Chuck and I first began near Lodge, SC, our point of beginning, which was the Walker families’ point of beginning, too. We quickly found northeast of Lodge the Little Salkehatchee River and immediately on the other side of the river was Carter’s Ford Baptist Church. What a great find. My 5th great grandmother was a Carter from here as was her mother-in-law. It seems that Joel and Elizabeth Walker were kin to each other before they married. Below are the families that migrated from here in 1828-29. Joel’s son Stephen Walker, who was 22-23 years old, born in SC (We are still unsure if he traveled with the family to Florida, though). Carter’s Ford was a natural ford on the Little Salkhatchee River. The Walker land was nearby, quite possibly across the road from the church. Today, that road is SR 217. Using old maps, it looks as if their land is north of the road on the west side of the river. It looked like prime cotton land or land for cattle. The Walkers did both. It was neat to stand where they probably lived and thrived for several generations before moving on. The land here is up on a ridge, high and dry. The fields here lie fallow; but when I got out to take a photo, a covey of quail jumped up in front of me. This land with its palmettos in the flood plain next to the river and its cypress swamps and stands of pine remind me of the Aucilla River and its river swamps. This is the low country just before rising up to the coastal plans below the fall line. We’re about 22 miles from Waltersboro, which was then and still is today the county seat of Colleton County. By studying the old maps, I’m fairly certain they went northwest from their home to meet up with the Fort Moore-Charleston Road. The only other route which intersects with US 78 goes southeast through a very low long swampy area, so I felt they didn’t take that route because of the wagons. They also would have had to cross the Little Salkehatchee here, and it is wide. We drove on into Lodge which is really just a crossroads and did not exist when the Walkers lived here. The old road today travels closest to US 64 and US 601. They built the latter road in 1927 and most likely on top of the already well-established trail. Just before we got to Bamberg, we crossed again the Little Salkehatchee River; but it is narrow here. They probably used a ferry because the river looks deep. The rest of US 601 like US 64 was high and dry. Today, there aren’t any old forests, but I felt like there might not have been any then either. After all they were moving on because the ground was worn out cotton fields. We intersected with US 78 at Bamburg, SC. I looked up the history of Bamburg to see if it was a town when they passed through here about 1828. The town was founded around 1750 by French Huguenots and Scots-Irish so it was definitely there then. As we drove west on US 78, I looked to see if there was a wiki page on this road. I found much more info. There are wiki pages for most federal and some state roads in the US. They contain great historical information about these routes. I questioned what the weather was like in the fall of 1827, but I found nothing online. I need to read local papers from Charleston, Augusta (1828 to 1829) and surrounding towns to see what I can find. Today, though, it is wet. When the family got to Bamberg, the town then was called Lowerys, a crossroads on the Fort Moore-Charleston Rd. I was able to look up the history of each town as we passed through. I looked for answers to questions like: when was the town established, what buildings are still standing today that were standing in the 1820s, and what was the town like in 1820? I was trying to figure out what the family saw as they passed through. The next town of Denmark, a railroad town in 1830, was built on the earlier town called Graham’s Turnout. If the railroad was built to Denmark by 1830, then this means they built the railroad here when the family traveled down this road. It helps me picture what they saw. I’m sure they used slave labor, because this was before the Civil War. The next town is Blackville. Blackville is in the part of South Carolina called the “Back Country.” Due to a plentiful supply of water for drinking and transportation, settlers came to this area prior to the Revolutionary War. They fought the Battle of Slaughter Field north of Blackville near the Mennonite church. When the railroad built between Charleston and Hamburg, John Black chose this area as an overnight stop for the train. Several hotels sprang up, as did a bustling railroad town. Blackville was established in 1833 and chartered in 1837. So though we know there was a settlement here when the family passed through, it looks like they built the hotels and railroad station a little later. Just so you know, though, Blackville became a marketing and transportation center and thrived until the Civil War. By February of 1865, though, sixty thousand Union troops had passed through the town. General Sherman met with his generals here, burned much of the town, looted, demolished the railroad, and continued on his march. So whatever existed when the family came through just before 1830 Sherman probably burned. Next we got to Williston, South Carolina. We noticed that all of these towns are about 6-10 miles apart. We know that the Wills family came to this area before the 1790 census, and that a settlement grew up on this road. When the family came through here, we’re not sure whether it was called Williston or Willis Station. It became another railroad stop, but stagecoach service existed between Charleston and Augusta, so it could have been a stage station, too. Finally, the family got to the Augusta area, but their road did not go directly into the city before crossing the Savannah River. Instead it came to a ferry down river from the city. When researching this ferry, I found that it had been called the Sand Bar Ferry; and someone took a picture of the abandoned ferry before it disintegrated. It is below. This ended Fort Moore-Charleston Road. So what was Augusta like when the family came through there in 1828-1829. The Native Americans used Augusta as a place to cross the Savannah River, because of its location on the fall line. They also traveled a fall line path, which later became the Fall Line Road. I found an old map which shows how the Fort Moore-Charleston Trail entered Augusta and how the Fall Line Road left the town. Old Map of Augusta Showing the Fall Line Road leaving Augusta up and to the left near the falls on the down side of the river and the Fort Moore-Charleston Road entering Augusta at Fort Moore. Oglethorpe named the town Augusta, in honor of Princess Augusta, wife of Frederick, Prince of Wales. The town was laid out on the flat slopes of the Savannah River. The townspeople got along peacefully most of the time with the surrounding tribes of Creek, Yuchi and Shawnee Indians. The Shawnees in the region were known as the Savano Indians. The name of the Savannah River is an anglicized version of their tribal name. When the family came through the city, it was already incorporated and had been since the 1790s. Still standing in the city today are two buildings that were standing there. They are the First Presbyterian Church and a mansion called Ware’s Folly, the home of the Gertrude Herbert Institute of Art. The house built by Ware was called his folly because he spent $40,000 to build it in the early 1800s. In today’s dollars it would be a $12 million house. I could see the Walker families riding by just to see what a $40,000 house looked like. Leaving the city, the families took the Fall Line Road. This road follows a geographical (water) fall line, where rivers drop to the coastal plain. Towns grew up on the fall line because cargo on boats had to be portaged around the waterfalls. These falls served as an early source of water power, so mills sprang up harnessing the power supplied by the falling waters, In time towns grew around the mills. 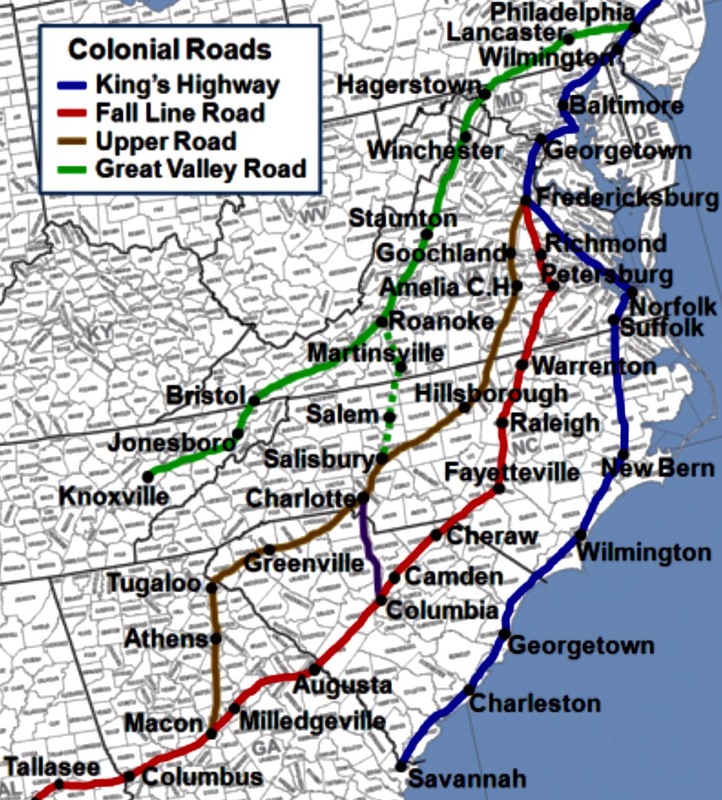 The Fall Line Road (or Southern Road) was the road built to connect most of those growing mill towns. It followed, though, an old Indian path as so many of these roads did. It was well established by the time the Walkers traveled it in 1828-29. The Fall Line Road continued on this path as far south as west of Milledgeville, GA until a series of Indian treaties from 1790 to 1826 opened up the Georgia and Alabama parts beyond the Macon area. Notice that this area opened up in 1826 and the Walkers moved south around 1827 to 1828. The road here still follows US 78 and will until we get to Thomson, GA. The first town past August is Harlem, but it was called Sawdust when the family came through. It was a lumber town and was quite wild. It was known for a lot of drinking, gambling, prostitution and carousing; and it was full of men. I don’t really believe they stopped here to spend the night. Not with the young children, though some of the men may have slipped into town on the pretext of needing some supplies. There are now several more small towns between Harlem and Thomson, but they did not exist when the family migrated through. Thompson Georgia was called Slashes in the late 1820s. The area between Harlem and Thomson is rolling hills and less of the flatlands that we drove through on the other side of the river in South Carolina. This is a very pretty area with lots of farmland, but when they passed through it was a booming timber operation. I guess that is why one town was called Sawdust and the other Slashes. It makes me wonder if this was all old forest timberland back then or if much of it had already been timbered out. Looking at the economics of the town will probably give me that answer. Once we passed Thomson, we then took SR 16 through Warrenton and down to Sparta where we took SR 22 all the way down to Milledgeville. This continues to follow the Old Fall Line Road. Warrenton, Georgia was a town with a wooden courthouse when the family came through here in 1827. 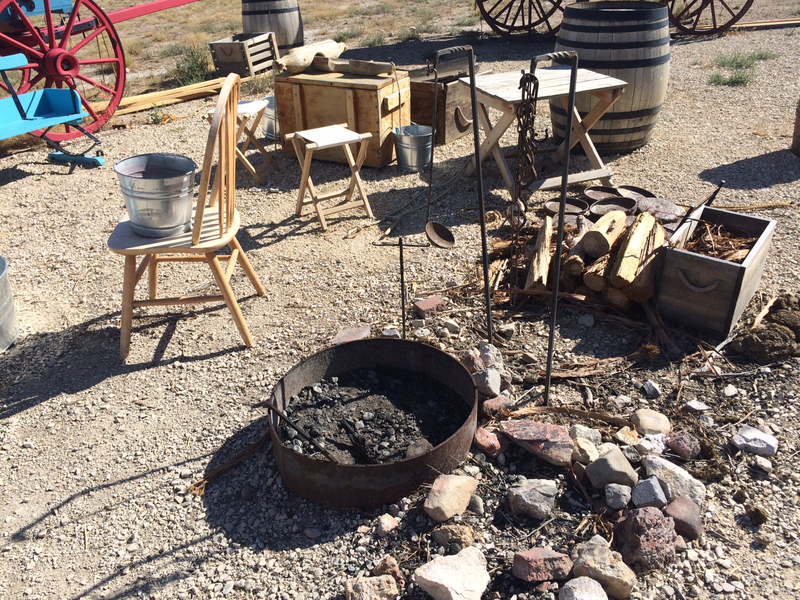 The Stagecoach Inn was here, and the family may have stayed there since they were not destitute and everyone probably needed a good bed and bath. We know that the Marquie de Lafayette stayed in town at the Allen House in 1835, and he gave us a pretty good description of the town in his journals. The Allen House has since been moved to Oglethorpe where it stands today. We crossed the Ogeechee River, and the fall line rapids are very visible from the road. I was about 95% sure that this was the Old Fall Line Road, but now I’m 100% sure. We stopped and took a picture of the rapids. This is beautiful country through here. I wonder if they thought about stopping? Maybe some of their party did. We have found no journals or diaries, so we wouldn’t know for sure. If they had waited five or six years later, they could have had it much easier. Railroads were being built several years right behind them. Jewel was the next town. It is very near the Ogeechee, but I cannot find any sign that Jewel was there when they came through. It seems that it became a mill town later on, a mill town sitting on the river. There probably was a ferry here at one time, and they may have used it to cross. Sparta was here, though, when they came through. It was called Sparta and may have gotten its name because it is said that its frontier residents fought like Spartans during the Creek War of 1811-1815. Major Charles Abercrombie laid out the town from his own lands in 1795, and his former home still stands on Maiden Lane today. Rabun Street, named for Matthew Rabun, the father of Georgia Governor William Rabun, became known as Maiden Lane when Sparta’s Female Model School was organized there in 1831. Abercrombie’s house was there when the Walkers came through. I imagine that the family looked forward to seeing Milledgeville. It was already established as the capital of Georgia and had been since 1804. The Treat of Fort Wilkinson (1802), in which the people,, hard pressed by debts to white traders, agreed to cede part of their ancient land. This opened up this part of Georgia. The restless Georgians and Carolinians quickly pressed west and south in search of new farmland; and the town of Milledgeville, which was carved out of the Oconee wilderness, helped accommodate their needs. So this was settled by the time the families came through here in the late 1820s. The town was laid out and modeled after Savannah and Washington, DC. It included four public squares of about 20 acres each. It stood on the edge of the fall line , where the Upper Coastal Plain merged into the Piedmont. Its Gothic revival style state capital was built by 1809, and it was then known as the first United States public building built in America. I believe the families would have wanted to see this building, which is still standing today. By the time they got to Milledgeville, the town had been prosperous especially after the cotton boom of the early 1800s. There were elegant houses with colossal porticoes, cantilevered balconies, pediments adorned with sunbursts, and fanlighted doorways. There were several very nicely built churches on its Statehouse Square. Imagine how they felt seeing this city, but remember that they lived a short distance from Charleston and had probably visited that city as well. Elizabeth Carter Walker’s mother was a Middleton, a family well-known in South Carolina and Charleston, so we feel certain the older members of the families had visited Charleston. Milledgeville, though, was a much newer city. Finally, the families left Milledgeville and entered the newly-opened territory, the area that the Creek’s had just ceded to the government. And that is where I will stop this post for this week. Below is a little list of questions that helped me determine what old trails my ancestors used when they migrated from SC to Florida. Finally, this question unique to this study needs an answer. How much of the forests had already been removed on the Fall Line Road southwest of Augusta? My main character’s name for the book I’m writing is Mary. 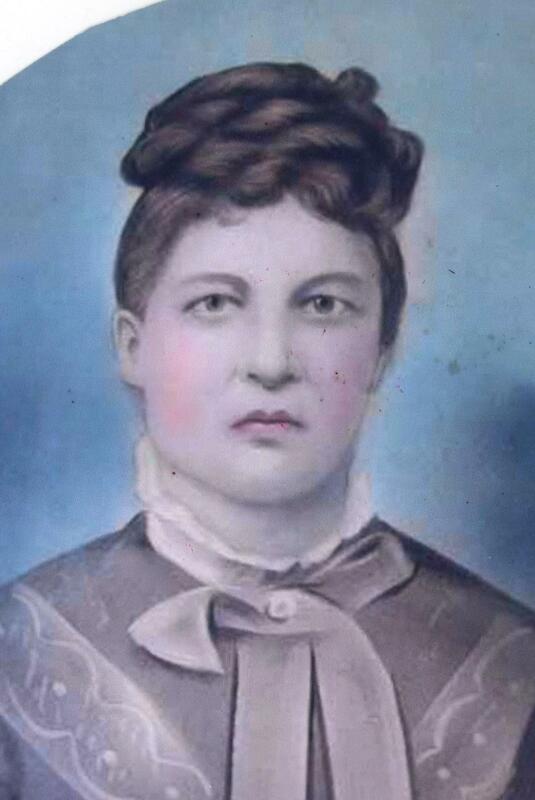 As you may remember, she is Mary Adeline Walker; and she is also my great-great-great grandmother. Using what I learned from the workbook, “Authentic Ancestors” by Lynn Palermo, “The Armchair Genealogist”, it was time to develop my protagonist, my central character. Since Mary is the one individual who ties all my family’s lineages together, she is central to my story. Here’s the rub, though. How do I describe her physical characteristics? I have no pictures of her, and there are no written descriptions, either. What’s a girl to do? Turns out my mentor had a good suggestion. She suggested an “Authentic Ancestor Collage” board, a tool to bring all the physical details together to create a visual for further reference while writing. I have done storyboards before, so that is what I quickly thought of, until she suggested that Pinterest might be a good place to pin any evidence found. So I placed what evidence I had in a new public Pinterest board entitled, “Something About Mary”. You can find it here. It turns out that I do have pictures of others in Mary’s family. For example, I have a picture of one of her brothers, three of her children including a daughter, a granddaughter, a great-granddaughter and a great-great-great granddaughter. I pinned all of them on the board. Then I also pinned a picture of a flowering bush that I will use in my first story about her. I wrote the story using some of the facts that I do know, such as the birth dates of her children. Like most women in her time, she was pregnant a lot. Also, I know that she lived in Monticello; and that at the time of this child, her parents lived out in the country north of where Elizabeth Church sits today near the Old Salt Road. I believe the Yauns own that property now. Another fact is that her husband was constable during this time and that the first Governor of Florida was from Jefferson County. I wove them into the story as well. I also used a story about a black snake that actually happened to me personally. I was trying portray her as a strong woman, but also a loving mother. Last, please don’t hesitate to let me know if you find something that you believe is inaccurate. The point here is to be as factual as possible, and for that I certainly could use your help. Enjoy! The story is below. Mary knew what this feeling meant. She had had it four times before, but this time it was too soon. She looked down at the baby suckling at her breast and their eyes locked. She always loved this time, when the little feller could stare and grin. He smiled his toothless grin and drooled milk out the corner of his mouth. She smiled at him, but thought that it was too soon for another to come. Until now every baby except James had come an easy two years apart. Even little Jesse here came an easy two years after his brother Zach, and Zach came two years after Val, and Val after James. Six year old Sarah wanted to help, and she was already doing what she could. The real help, though, came from Mary’s step-daughters Ellen and Florry, who were twelve and eleven respectively. Mary found it hard to believe that she was only one year older than Sarah when her family came to Monticello. Much had changed in those two decades since. Just in the last seven years she met William, married, became a mother to three motherless children and had five more babies . She looked back down at Jesse. Poor thing. He would be booted out of the cradle long before the others had. 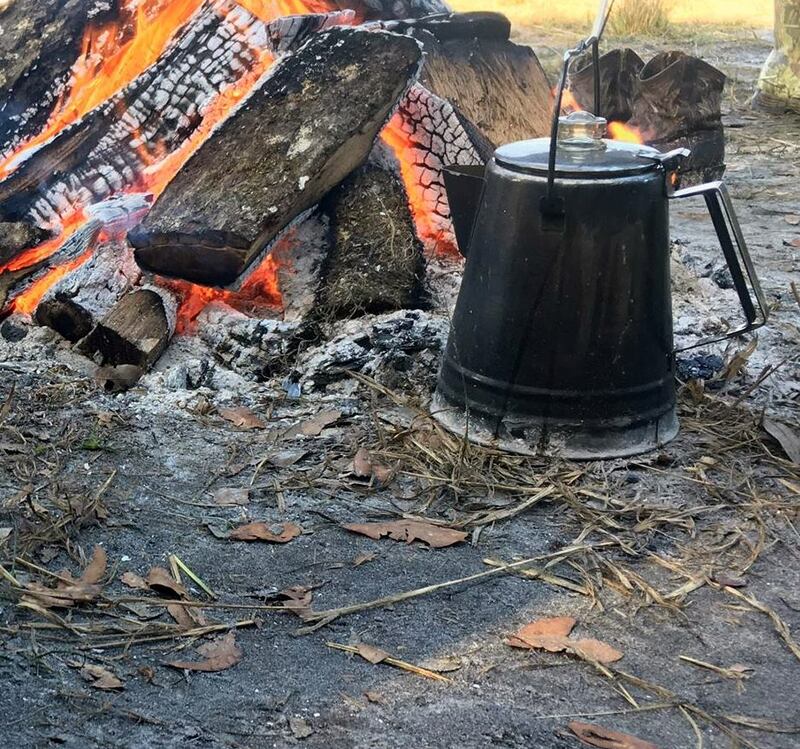 It was a warm day. Winter had lingered too long, but outside her window a wild azalea was already blooming. The delicate pinkish blossoms stuck up like someone had picked a little bouquet of flowers and attached it to one single long stem sticking up from a bush of green. Each little star shaped flower looked as if it were poking out its delicate whiskered tongue. What a blessing to have this here. Where she grew up out in the woods, these azaleas were everywhere, especially in the areas near the swamps. She missed living there with her parents, so two winters ago her dad dug one up and transplanted it by her back window. Every spring she waited for its blooms and subsequently missed home all the more when they quickly faded. Her parents didn’t live far away, and she saw them and her brothers and sisters anytime they came to town. The home place was only a little more than a half days ride to the east by wagon or carriage and even less by horseback. 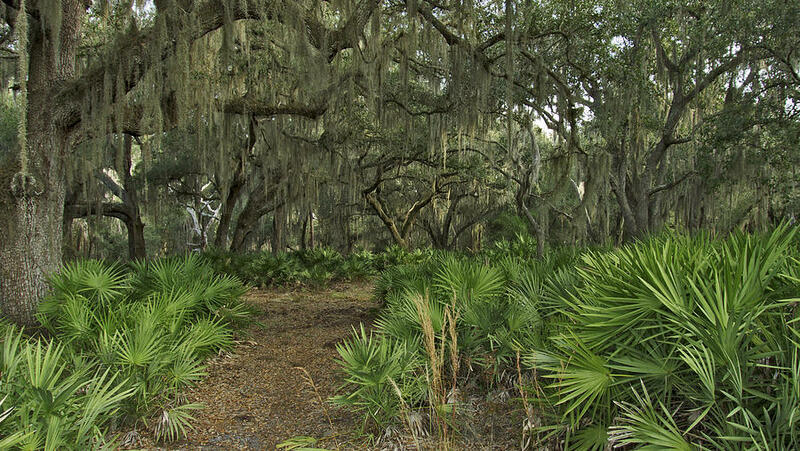 Between town and her parents’ home was a wilderness of cypress swamps, towering pine forests, palmettos so thick that it was almost impassable and always the moss floating down from the massive oak limbs. In the pines she knew there would be wild dogwoods blooming, and she wished she could make the trip this warm day to see their blossoms peeking around the trunks like white lace. The silence was what she missed most. It would be deeply silent except for an occasional wind whispering through the pine boughs. The road there was barely more than two ruts, and traveling by horseback was easier. 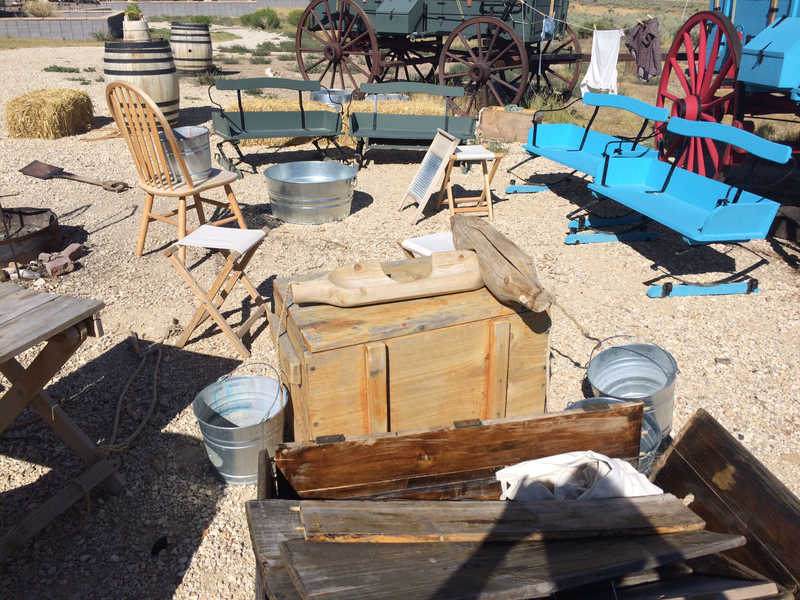 Wagon wheels either bogged down into the shifting sand when dry or slid off the slick red clay when not. The rains here came suddenly and frequently often with little warning. Horses and mules were the transportation of choice, but women were seldom seen straddling either. Outside her window here, though, there was always chattering and yelling, constant clanging of metal harnesses, and the dull thud of horse hooves on dirt. Monticello’s streets were dusty when it was dry and muddy when it wasn’t. Her house was an easy distance from the center of town, and nothing much happened that she didn’t see. Jesse was much more interested in the noises outside, and she realized that he was done so she pulled down the soft fabrics of her chemise and bodice and handed him to Florry who had just walked into the room. Mary noticed that Florry always seemed to know when she was done. Florry was born Florida Mae, though she didn’t much like the name. Mary didn’t think it was a bad name. Florida seemed pretty, enough. After all, it was Spanish for flowers; but Florry knew that she was named after the Territory, not flowers. Born in 1840, Florry’s father along with some of the other men in town, worked hard to achieve statehood, which finally happened five years later when Florry was only five. Mary stepped out into the warm sunshine on the front porch just as Governor Moseley and another man walked by leading their horses and wearing buckskin leggings and homespun blouses. Moseley tipped his hat and continued talking to the stranger as they made their way toward the center of town. Mary arched her back with her hands at the small of her backside and stretched her shoulders as she wondered when William would be home for dinner or if his business would keep him away again tonight. There were no set hours for a Constable, so she never knew. She stepped back inside just as Ellen started screaming from the kitchen. Running into the room, Mary saw a black snake halfway up the back steps with his head held up about a half foot off the floor just inside the door. He was a nice one, all black and shiny, almost blue. He quickly turned his head from Ellen to Mary with his half-lided gaze. She knew he wasn’t poisonous, but she also knew that a bite from him would hurt bad. Ellen slowly began backing up, never taking her eyes off the snake, while Mary picked up the broom which was sitting by the door she had just entered. She slowly moved toward the snake stomping her feet, but it didn’t back down. Mary said, “Oh, you’re a fearless one. You just need to go back where you came from.” She began to push the broom toward him , but he lunged at the broom. That’s when she gave a big shove, and his body tumbled down between the steps. When Mary looked back over her shoulder, she saw all the kids standing in the door and hall. John, who was twelve, said, “I’ll go kill ‘em.”, but Mary said, “no, he’s a good ‘un. Let him be.” She knew that the black snake would protect their door from other less desirables. He was territorial and wouldn’t let another snake take residence. Like most of everything else in the Territory of Florida, she knew you often had to take the lesser of two evils. Mary’s daughter Laura, who was born seven years after Jesse in 1857. For most of January I have been getting ready to start writing a book. I have to admit that it has been on my mind for years, but who had any time for such. I was embroiled in a full-time career, raising children, keeping house, traveling and trying to spend time with my husband. There was no time for such extra-curricular activities. Somehow, though, I did find time to research my family. This was my hobby. This hobby started when I was in my mid twenties, and I’m still doing it today. Problem is, I’m getting old; and now I worry that I may never write any of this down in a way that will interest the rest of the family. My fear is that I’ll die, and the kids will find all these boxes of research. It could happen while they are raising their children, keeping house, working and trying to spend time with their families. They won’t have time, either. So here I am. Chuck and I retired last May, and I’m finally ready to write. I started before Christmas by joining a group called the Family History Writing Challenge, which is a 28-day commitment to writing about my family history. It runs February 1st to February 28th. I was having a little trouble getting started, so I signed up. The challenge is designed to help me develop good writing habits, to provide inspiration and to offer pointers to help me write. It helped me organize my thoughts by asking me questions that led me to develop answers, such as whether I wanted to write about a single ancestor, a surname, or an entire branch of my tree. I began to think about the timeframe or the setting, about any added research needed, and about narrative fiction or nonfiction. I decided to write the book as narrative non-fiction. It suggested I set a goal, so I decided to write at least 500 words a day. I started writing this morning. I have a set time on my calendar, and an alarm that sounds like Big Ben in London went off at 1 p.m. to clue me in that I should be sitting at my desk and beginning to write. It worked, because that is just what I did. When the hour was up, I had written 910 words. I decided that I would begin with Mary Adeline Walker, my third great grandmother. I know that she came with her family to Florida about 1827 at the age of seven. I had planned to begin my story from her point of view, and the setting would be the trail that the family had most likely used as they made their way down from South Carolina. That is when I ran into my first problem. I discovered that I needed more research about this trail–a lot more research about this trail. So I switched gears, so as not to be thrown off the course so early in the process; and I started writing from a different angle. 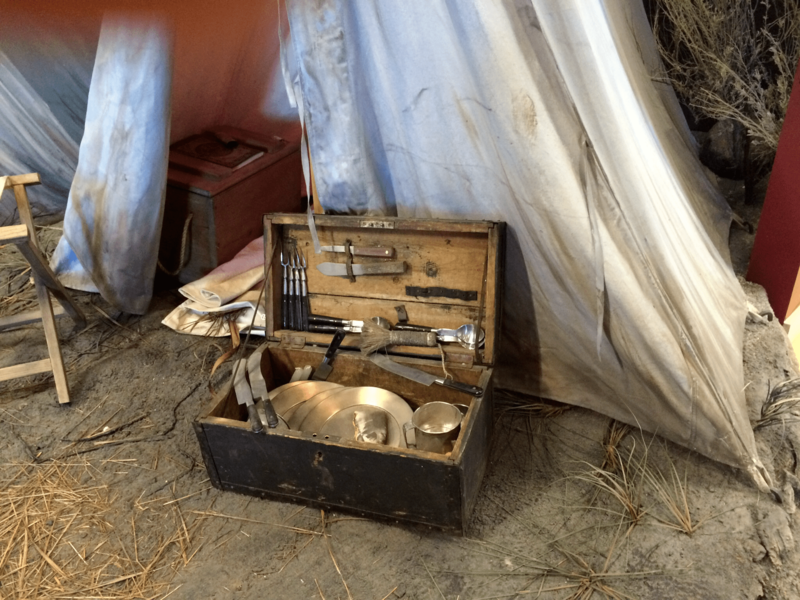 I simply started writing about something that I knew about–how I arrived at and placed Mary Adeline Walker as my main character. After writing several paragraphs, I realized that I wasn’t writing an intro but instead I was writing a forward. So below are a few paragraphs of my incomplete intro and almost all of my forward. What if it’s not good enough? Well, that is for all of you to decide. I try not to play those head games with myself. My pea brain doesn’t fare too well under my own criticism. Outside criticism works better for me, and so I invite your comments! There was an old Indian Trail that once led from…. It wound through the hickories and oaks of the Piedmont plains of North Carolina down into the hills of South Carolina and on down into the central plains of Georgia. DeSoto took it up for a ways, because there were the whispers of gold up there somewhere and later the white man took it for his own and widened it for his wagons and sleds. To a seven year old girl named Mary Adeline Walker, though, it was the adventure of her lifetime. She was the first born of Jesse and Elizabeth Wilson Walker, born in 1821 on the Little Saltketchy (sp) River in Colleton District, SC. Along with her Grandparents Joel and Elizabeth Carter Walker and several of her uncles James, Joel,Jr; LIttleberry and David and their families, they traveled this trail in 1827 arriving at the newly formed Jefferson County in Florida. The new county seat, though, had been here a while. Built next to a little Indian village, the village leaders claimed the high ground for the center of the town. My Grandmother Hamrick was a talker so much so that my dad said that we didn’t need to take the “Monticello News”, because Annis was enough. That is where all of this took place, in Monticello, Florida, a little town in North Florida, almost now a bedroom community of Tallahassee, but in mental miles much more than thirty miles away to the east. It was Grandma Hamrick who told the family stories, along with my Granddaddy Hamrick, for it was his family that reached back more than four generations in this county, or at least we thought so at the time. By the time I was fourteen, Granddaddy died of a cerebral hemorrhage one Sunday morning in March while the two of them sat watching the First Baptist Church of Tallahassee on their television. He got up that morning and said, “Shug, can we miss church. I don’t feel so good.” Shug was short for Sugar, and it was his pet name for her. From then on, I got all my local family stories from Grandma; and those are the ones I seem to remember the most. There was never any mention of anyone before Granddaddy’s Grandfather William Aseph Hamrick, except for one story about William’s mother who daringly loaded all her children in a wagon and came to Florida from York, South Carolina, shortly after her husband was killed in an accident. They said that she was mad at her in-laws and that it was before the “War”, which for those of you not from the southern part of America, this means the American Civil War. Stories often went that way. They would say, “before the War…” or “just after the War…”. Needless to say, it was a very important event to folks down here, even those who were born many years after the War. What we found years later, though, were several more generations; but they materialized through the women of our family, our maternal lines. This led us to Mary Adeline Walker. She is the common denominator, and I had never heard about her until one day when I became a temporary secretary to County Judge Charlie Anderson in Monticello. I was 25 and married. I had a one year old baby. It was 1978. My friend Pam Cooksey was pregnant, and she was looking for someone to work in her office for about four weeks, until she could return to her job. I was already beginning to go a little stir crazy, so I agreed. What I did on the job is insignificant to this, but the office where I worked became very significant. In a vault next to Judge Anderson’s offices were many of the territorial Florida records for Jefferson County dating before 1845. I began to wonder if there were secrets there about my family. I started with William Aseph and quickly found him and his family in the years after the War in census records. I had gone to Tallahassee to the Florida State Archives to search through their books. The Hamrick trail ran out before 1850. They were not in the 1840 books, and this fit the story that they had come sometime just before the War. Well, what about Granddaddy Hamrick’s mother? Her name was Hattie Augusta Lightsey Hamrick. 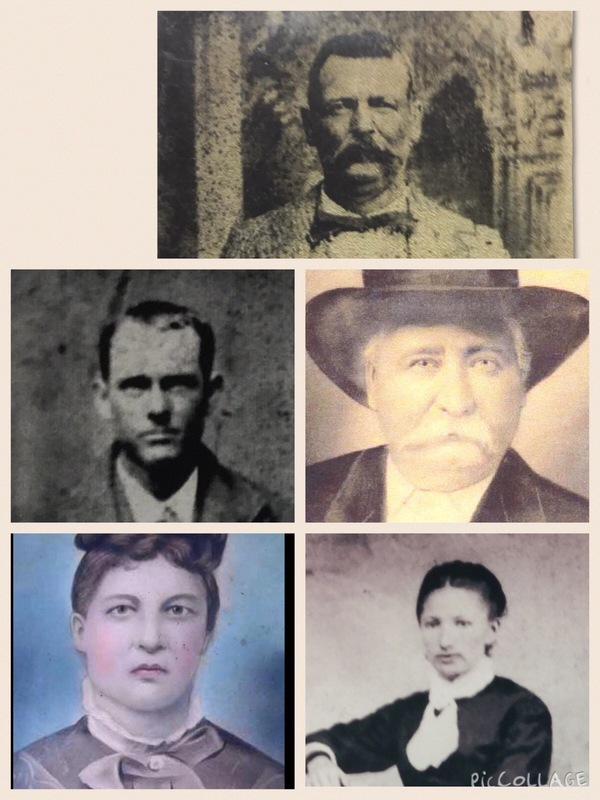 I found that her lineage traced all the way back to George Lightsey, her great-grandfather. I found him in Florida’s 1830 census. Her parents were George Henry and Laura R. Lightsey. Back at the Judge’s vault, I began looking for anything that had to do with the Hamricks and the Lightseys, until one day I found George and Laura’s marriage certificate. Her name was Laura R. Andrews, and just like that I had another new surname to search. Andrews was a surname I had never heard them talk about, though I knew a lot of Andrews in the area. Laura R. Andrews in 1850 was still living with her parents’ William H. and Mary A. Andrews in Monticello. With this information I went back to the vault and found a marriage certificate for them dated 1843. Mary’s maiden name was Mary Adeline Walker, and finally I had a surname that fit into some more of Grandma Annis’s early stories. There are lots of Walkers in Jefferson County, and I noticed that almost any who lived in the northern part of the county were always described to me as “kin”. The exact way I was kin was never explained, but the conversation always went a little like this. Grandma would say, “Oh, you’re kin to him,” which really meant “Honey, you probably shouldn’t date him.” So I thought I took care of that problem and married into the family of Walkers from the southern part of the county. The northern Walkers weren’t the only ones to whom I were “kin”. It was also the Bishops, Hartsfields, Kinseys, Scruggs, Sledges and too many families to name right here and now. What I stumbled upon while working for the Judge was that all my family’s roots led back to or through this Mary Adeline Walker. She is the keystone for my family’s lineage in Jefferson County; however, she was not our first Walker to come here. She made the trip down with her father and grandfather. Counting them, I discovered that I was the eighth generation to live in Jefferson County; and my newborn daughter was the ninth. What I also stumbled upon was a life-long hobby called genealogy. I am now over 60 years old, and it is finally time to write some of this stuff down.